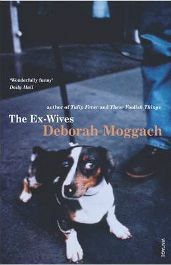 I used to read quite a few of Deborah Moggach’s books a few years ago and loved such ones as See Saw and Final Demand. Some of her later titles did not appeal so much though so I sort of forgot about her books – that is until I was given The Ex-Wives for Christmas. I enjoyed being reacquainted with this author and although I wouldn’t rank it as one of my favourites it is an absorbing and tantalising read. Strangely, the accolades on the cover claim that this book is a comedy but, although there were some funny moments, I did not really agree with this description although I would find it hard to describe exactly what type of book it is. I would suggest that it is part mystery with a touch of the sinister about it with the odd element of humour added in! The main character is a young woman called Celeste. At the start of the book her mother has died and after discovering a letter from her she moves to London and sets about reinventing herself. Part of her quest to do this involves deliberately meeting and getting to know an ageing failing actor called Russell Buffery, affectionately known as Buffy. What Buffy does not realise though is that Celeste is actually more interested in finding out about his ex wives and partners of which there are many! It all seems a bit sinister especially as she starts actively pursuing them and getting herself invited into their homes and lives. Celeste’s movements take her to lots of interesting places and as she meets more and more people she learns a great deal about Buffy. Even though none of the ex wives wish that they were still married to Buffy, they all do regard him rather fondly and don’t have too many regrets. Buffy is also very keen to start up a relationship with Celeste but although seeming to like him, she does not seem interested in taking this further. Her actions are at times very puzzling indeed. It is an intriguing tale that will hook you in from the very start and keep you guessing to the very last page almost. The story line is very good and very original too and with a host of interesting characters. The two main characters – Buffy and Celeste – are both very interesting. Buffy likes to portray himself as a down on his luck pathetic has been which is not particularly the case. He still gets work, if less than before, and he is also rather endearing. I definitely warmed to his character. Celeste, on the other hand, appears quite cold and calculating but I suspect that this is deliberate because she needs to be quite enigmatic in order to keep the reader guessing. I didn’t think that I really got to know her character though even at the end. Many of the other characters were quite a bit of fun too and especially the ex wives who were all very different to each other. The story moved along at a good pace and kept my interest throughout. At times, especially at first, the writing felt a bit disjointed but once I got used to the style it did not bother me. I enjoyed it a lot and I think now I am tempted to read a few more books by Deborah Moggach. No Comments on "The Ex-Wives"